Call President Obama now to save Bangladesh from becoming another chaotic terrorist producing factory. 212-456-1111. Please use the file on the right to understand the current action alert. We will be providing the latest information on what is going on in Bangladesh, especially as it relates to the War Crimes Tribunal. Please visit back often, read up on what's happening and send information to your family and friends. We also have constant updates on our News page. Please also like us on Facebook. 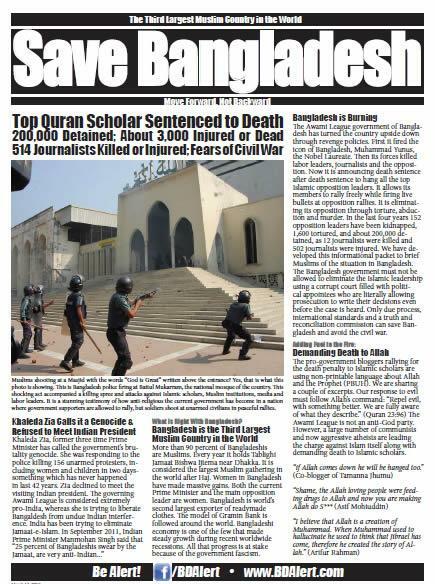 Bangladesh's Jamaat-e-Islami's reply to a statement of Human Rights Watch on March 1, 2013. The Bangladesh Jamaat-e-Islami (“Jamaat”) notes with dismay that Human Rights Watch (“HRW”) has alleged that its supporters have been involved in ‘lethal’ and ‘unacceptable’ acts violence. HRW has also indicated that Jamaat should issue a public statement to its supporters to stop the violence. It is understood that in issuing the statement HRW relied on newspaper reports from Bangladesh. Jamaat would like to clarify that its members have not instigated the recent spate of violent clashes with the police. Nor are the protests all over the country organized by Jamaat. The vast majority of protests are by ordinary Muslims who have come out on to the streets to protest the death sentence passed by a controversial International Crimes Tribunal against Mr. Delwar Hossain Sayedee. Sayedee, as an Islamic thinker, has a popularity beyond his political identity. 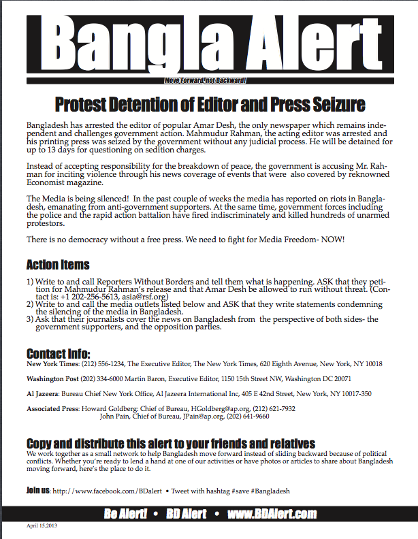 Jamaat would like to point out that due to political repression and mass arrests of its members and followers, its political activities have been severely restricted. On 19 September 2011, its Central and Metropolitan Offices were forcibly closed by the police and have remained closed ever since. Its Ameer (i.e. President) is in jail. There are warrants of arrest issued against the Acting Ameer and he is now in hiding to avoid custodial torture. The party’s Secretary General is in jail. The two people who were subsequently appointed (one after the other) to replace him have also been arrested and are now in jail. The third person appointed is now avoiding arrest in fear of custodial torture. Of the 7 Assistant Secretary Generals, 6 are in jail. 12 of the 16 member Executive Committee have been arrested. Of the 6 City Ameers in the 6 metropolitan cities, 2 is in jail, while the remaining 4 are in hiding. At the grass-root level, the situation is far worse. 54 of the District Ameers in the 64 districts of Bangladesh have been arrested. The rest have warrants of arrest issued against them. All of the sub district (or Upazilla) Ameers in the 493 Sub Districts of Bangladesh have warrants issued against them and are now in hiding. As such the leadership of Jamaat is either in jail or is living in fear of arrest and torture by the police. Jamaat no longer has effective control over its members and supporters. Even the issuer of this rejoinder is evading arrest in fear of custodial torture. As such it is inconceivable that Jamaat is in a position to instigate the clashes all over the country which began on 28 February, 2013. A number of anti-Jamaat newspapers such the Daily Star, the Prothom Alo and the online news portal BDBNEWS24 have been making unsubstantiated allegations that Jamaat has been burning temples. These newspapers have been supporting the call for banning Jamaat. Moreover, they have indiscriminately described all protestors against the verdict by the International Crimes Tribunal as members/supporters of Jamaat. The news provided by most media outlets in Bangladesh are now biased towards one view or the other. Independent and fair reporting is almost no longer possible by the local media. It should be mentioned here that although 3 madrasahs (Islamic religious schools) have been burnt in northern Bangladesh, Jamaat has encouraged restraint amongst its supporters not to highlight the issue. Jamaat has also issued a statement that it was not involved in any attack on temples. Jamaat would like to take this opportunity of informing HRW that around 120 people have been killed over the last 4 days, half of whom were killed on 28 February. Five of the dead were policemen. The rest were innocent civilians including women and children, all of whom died from bullet wounds. Women protested with their brooms and brought their children along. Live ammunition was used to disperse crowds, as the government was keen to show that the trials are universally acknowledged as fair. The only weapons used against the police (who were dressed in full riot gear) were brick bats. As such the police action was unnecessary and disproportionate. In many cases (reported on a number of television channels), the police were only attacked by angry mobs only after they had run out of ammunition. Such action by the police is a continuation of the custodial torture and killing of member and supporters of Jamaat. Over the past couple of months the police have been randomly picking up member/supporters of Jamaat and have shot at them at point blank range (while in their custody) in full view of the media. The images of such point-black shooting have been documented and archived and are now available on the internet . Although we note that HRW has objected to the use of the word genocide, the scale (120 dead in 4 days) and nature of the police actions in over 20 districts of Bangladesh clearly indicate that murders as crime against humanity have taken place. Supporters and followers of Jamaat and opponents of the International Crimes Tribunal have been systematically targeted by the law enforcement agencies. The police have been selecting members of Jamaat and shooting them. All this should be seen against the backdrop of the government move towards eliminating Jamaat and its institutions, to which HRW has referred to in its statement. We hope international organizations such the HRW will not shy away from correctly identifying the action of the police in Bangladesh as a crime against humanity. We believe that any delay by international community in making a proper assessment of the situation will encourage the police to be more violent and continue with their actions in violation of national and international law. Finally, we thank HRW for protesting against the violations of human rights in Bangladesh. Please download our latest Action Alerts, print them and distribute them in your communities. They will provide the latest information on the War Crimes Tribunal in Bangladesh and what you can do to help. A rally to protest the War Crimes Tribunal in Bangladesh was held in New York on April 13, 2013. Will Bangladesh more forward or backward? That is the concern that has brought us to form this small network to engage others to keep Bangladesh on track to move forward. We welcome new ideas and value enthusiasm from members and volunteers, new and old.